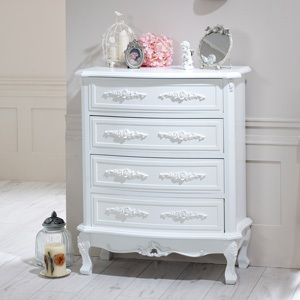 From our Rose range, this is a Furniture Bundle of a white painted wooden Two Drawer Bedside Table with a useful lower shelf, a Four Drawer Chest and a Dressing Table set complete with Mirror and Stool. 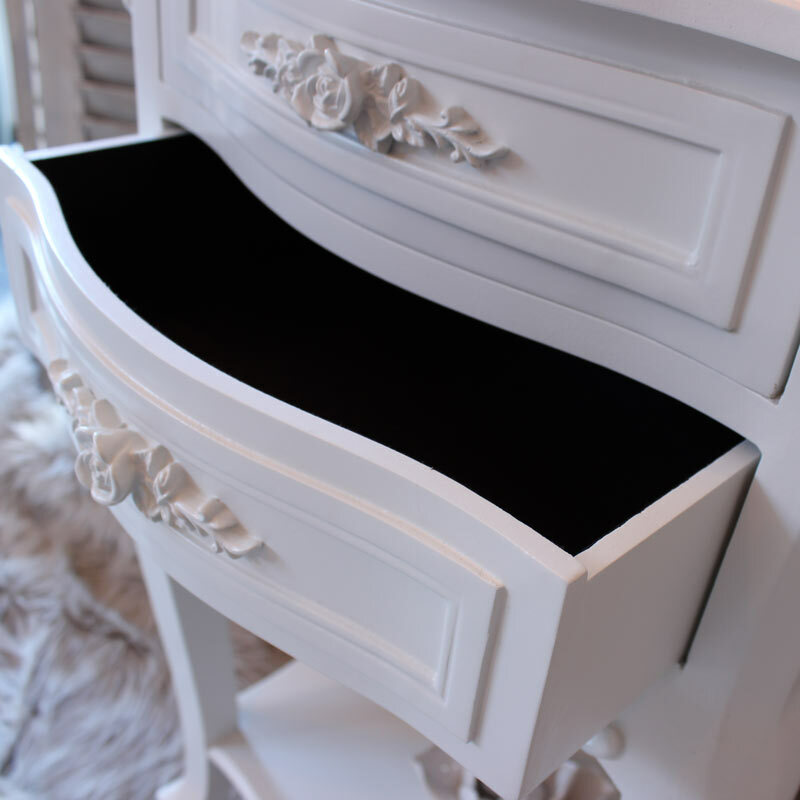 They have carving to the fronts of the drawers and these hold the knobs for the drawers which are fashioned as roses. 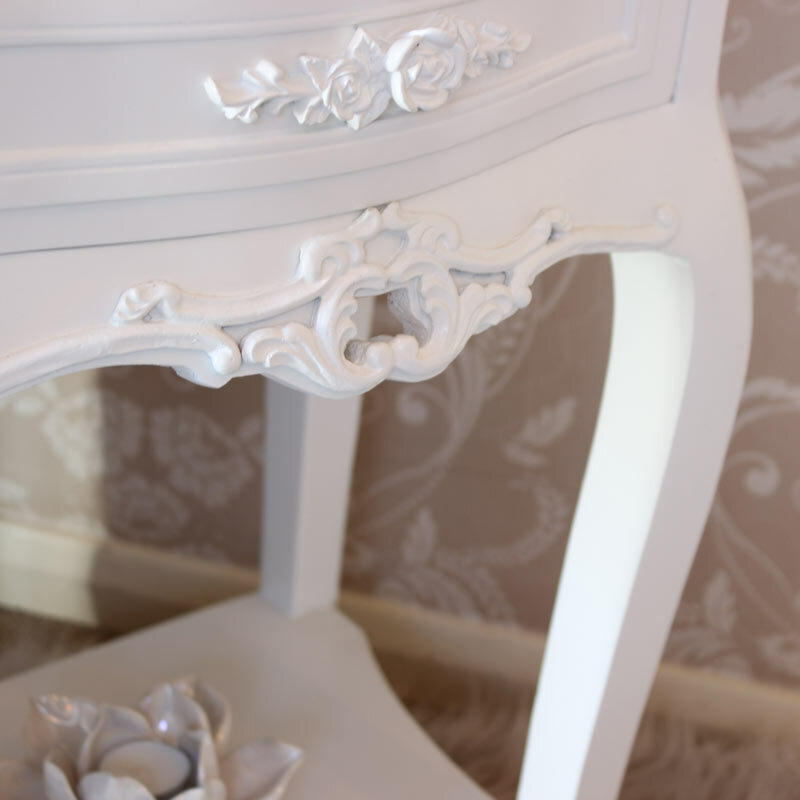 The carving is also present on the sides of the cabinet fronts and to the fascia. 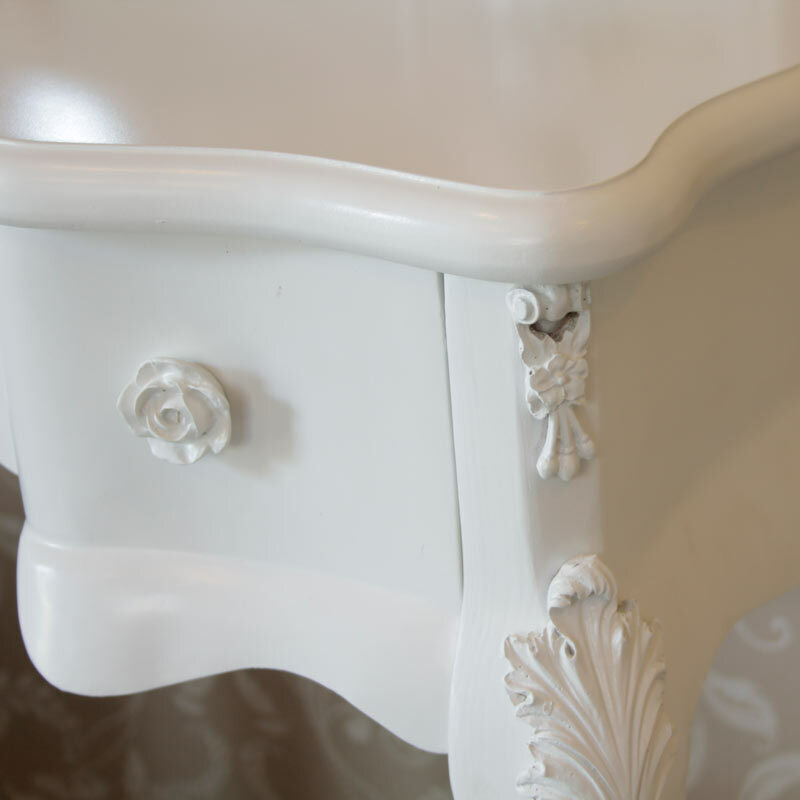 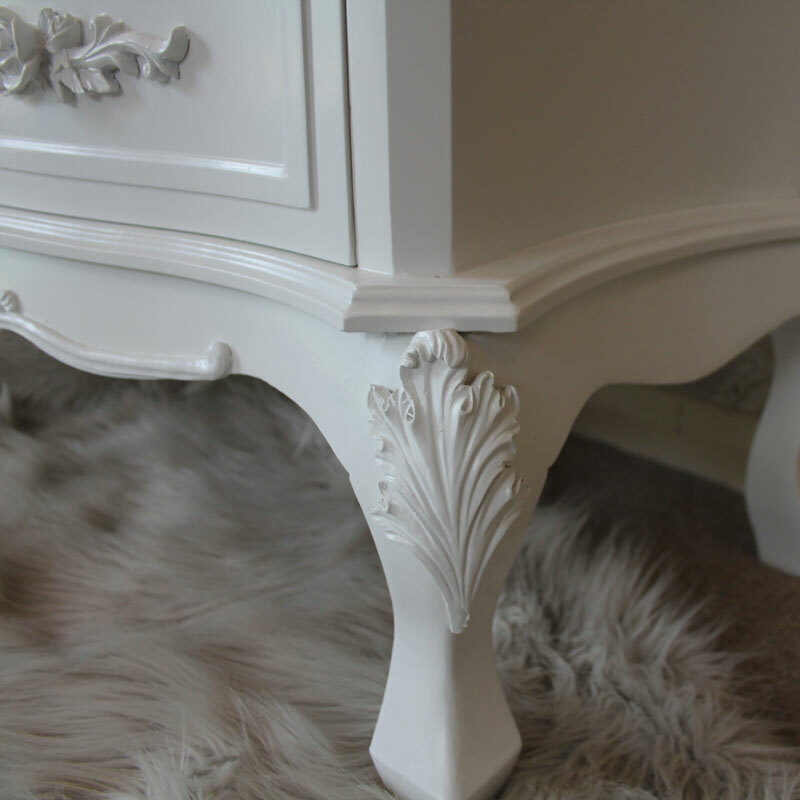 There is lots of curved detail to the items which feature curved legs too. 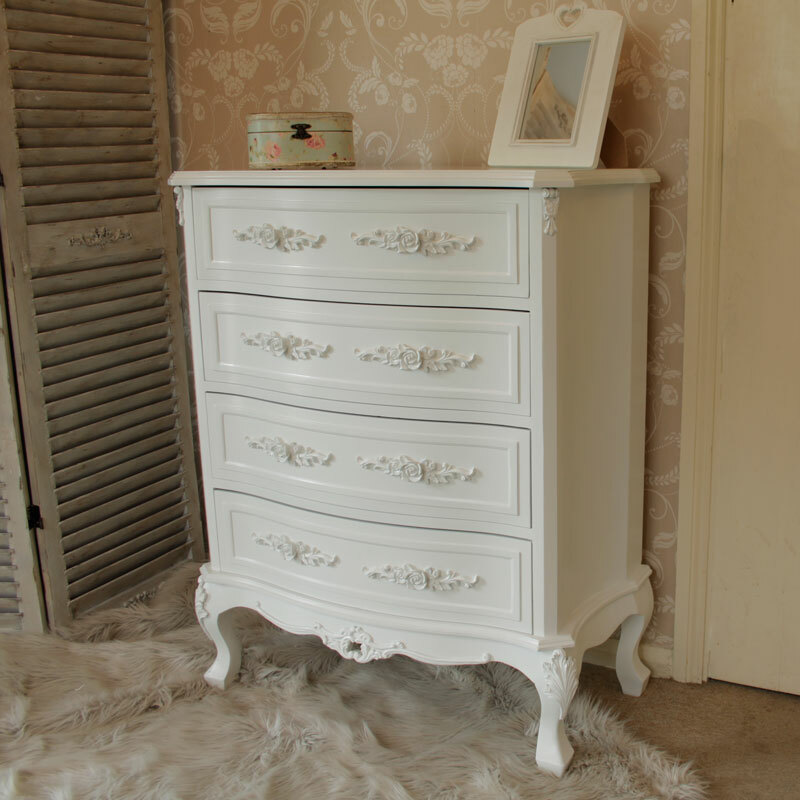 The dimensions of the bedside chests are 67 cm x 50 cm x 35 cm (height x width x depth). 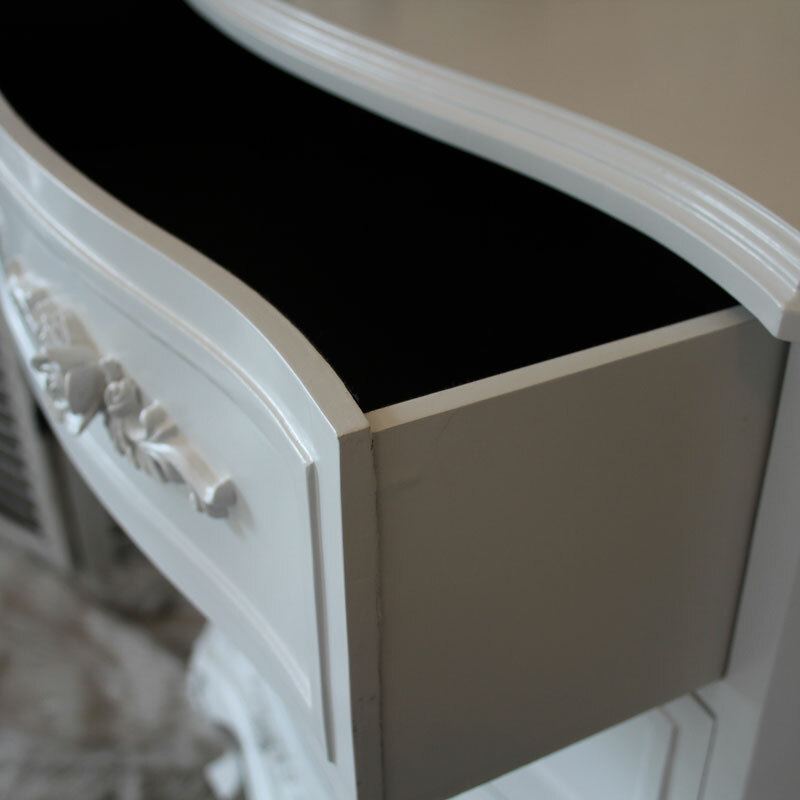 The drawers measure 12 cm high x 29 cm wide and 30 cm deep and are useful for storing bedtime reading as well as trinkets. 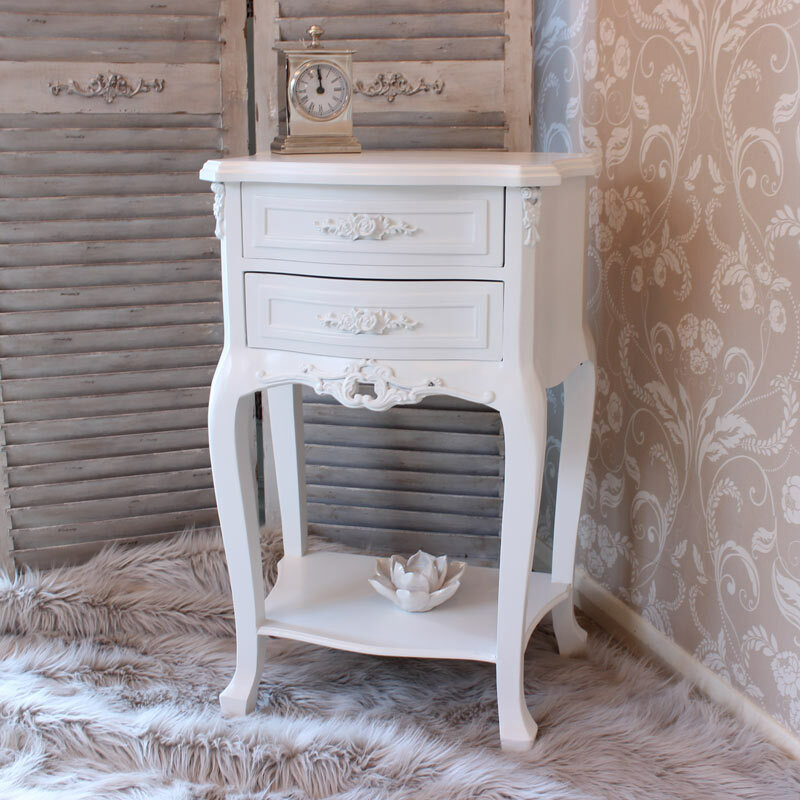 The dimensions of the storage chest are 81 cm x 98 cm x 40 cm (width x height x length) with the drawers being 16 cm high x 62 cm wide and 35 cm deep. 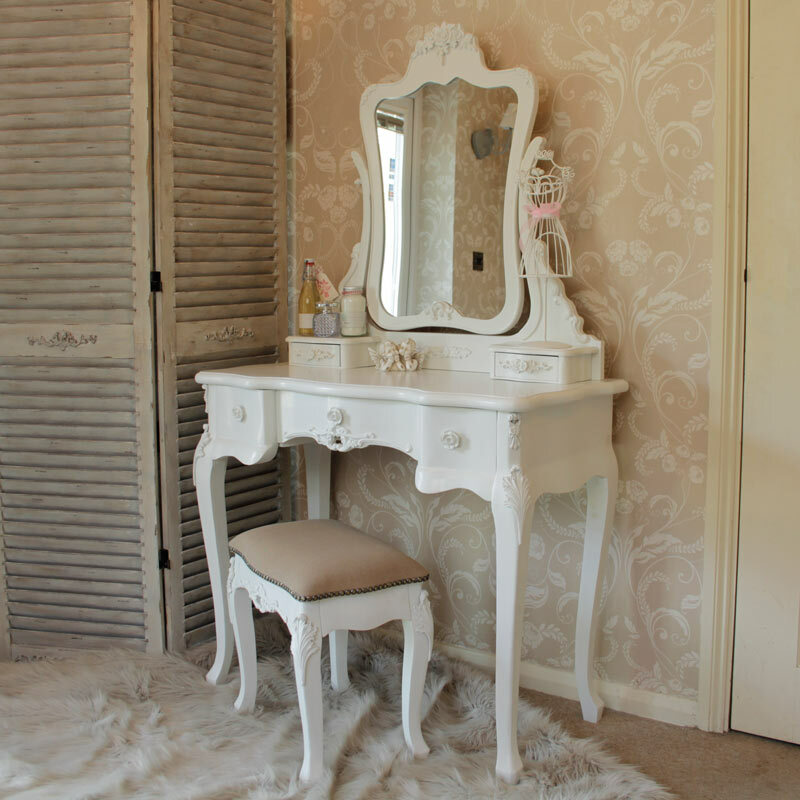 The dressing table measures 157 cm x 91 cm x 45 cm (width x height x depth) including the mirror which has trinket drawers in its stand and it swivels to suit your needs. 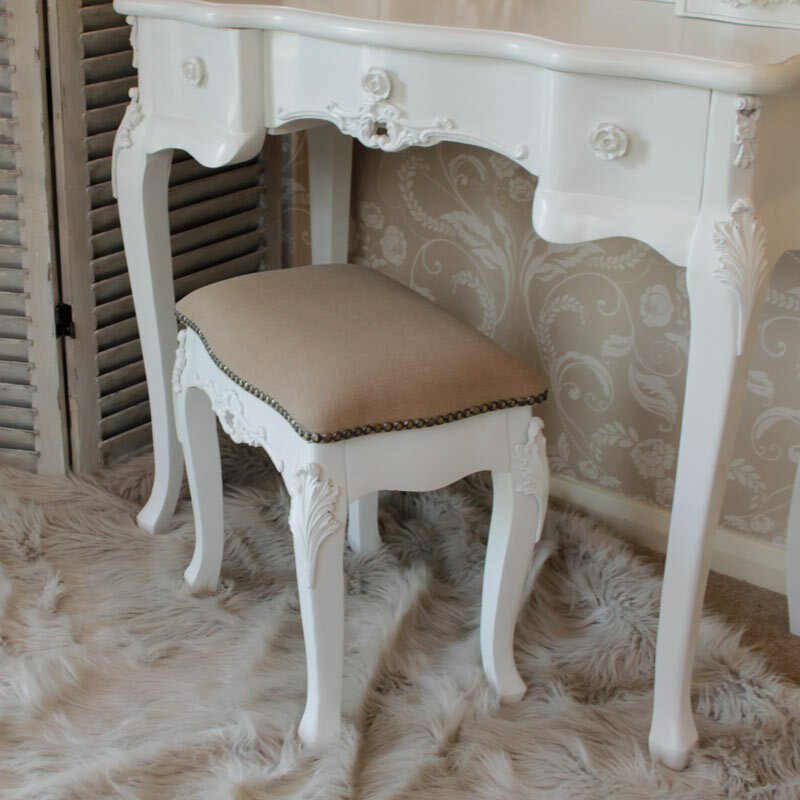 The stool measures 41 cm x 30 cm x 44 cm (height x depth x width) and the seat is padded in taupe. 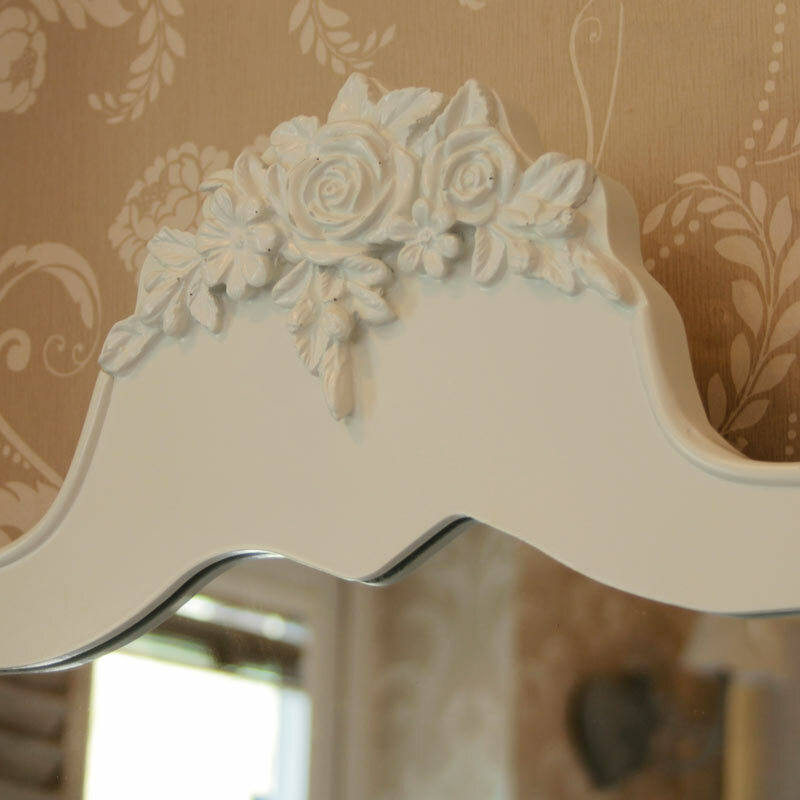 There are other items in this range to complement or complete your styling.